Guinea-Bissau should amend national legislation governing police use of force and firearms to comply with international law. International law restricts use of firearms to where it is necessary to confront an imminent threat of death or serious injury or a grave and proximate threat to life. The prevention of crimes, including crimes against the security of the State, can only be done in observance to the rules established by law and with respect for the rights, freedoms and guarantees of citizens.Art. 21(3), National Constitution of Guinea-Bissau (as amended through 1996). 1 - The moral and physical integrity of citizens is inviolable. 2 - No one shall be submitted to torture or to cruel, inhuman or degrading treatment.Art. 37, National Constitution of Guinea-Bissau (as amended through 1996). The State and other public entities are civily liable, jointly with the officials of their organs, personnel or agents, for acts or omissions committed in the performance of their duties and due to their exercise, resulting in the violation of rights, freedoms and guarantees, or any harm caused to others.Art. 29, National Constitution of Guinea-Bissau (as amended through 1996). 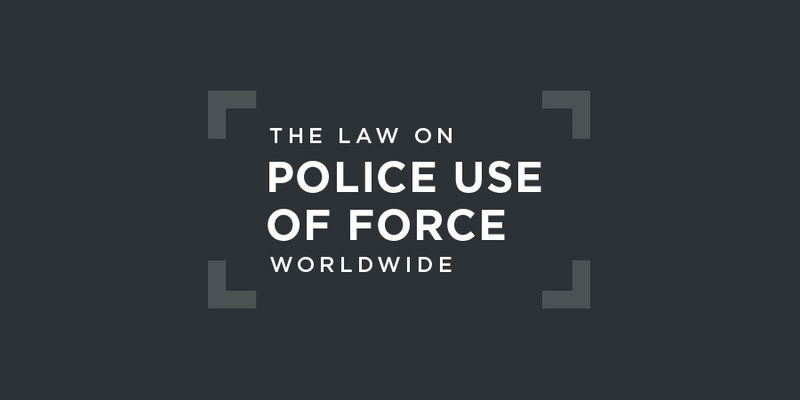 Police use of force is generally restricted by the principles of necessity and proportionality. The law allows firearms to be used in a number of scenarios, such as to confront imminent or ongoing violence directed at the police officer or a third party, or to prevent a “serious and imminent attack on socially beneficial installations whose destruction would cause material injury".Art. 15, 2010 Organic Statute of the Judiciary Police, Presidential Decree 14/2010 of 15 November 2010. No one shall be subjected to cruel, inhuman or degrading treatment or punishment. d) obtains from him/her or another person confession, testimony, statement or information.Art. 103, 1993 Criminal Code, promulgated by Council of State Decree No. 4/93 of 13 October 1993. There is no independent police oversight body in Guinea-Bissau. Internal disciplinary units of the different police services are responsible for investigating complaints of unlawful behaviour. The repeated interference of the defence and security forces have contributed to political instability and the deterioration of the security environment, thus constituting a serious obstacle to strengthening the rule of law and the consolidation of peace. "Guinea-Bissau", Universal Periodic Review of the Human Rights Council, UN doc. A/HRC/WG.6/21/GNB/1, 9 January 2015, §46. Continue to engage its international and regional development partners for support in the continued implementation of its defence and security sector reform initiatives, and to take initial steps to ensure that law enforcement personnel are provided with appropriate human rights education and training.Report of the Working Group on the Universal Periodic Review: Guinea-Bissau, UN doc. A/HRC/29/12, 13 April 2015, §96.96. Notes with satisfaction the exemplary Bissau-Guinean defence and security forces’ continued posture of non-interference, which, so far, have refrained from intervening in the political and institutional crisis. Council urges all parties to refrain from actions or statements that could further escalate tensions and incite violence in the country.African Union Peace and Security Council Communiqué, AU doc. PSC/PR/COMM. (DCCLX), 29 March 2018, §5. Details of prosecutions or civil cases for unlawful use of force by police or prison officers are hard to obtain.